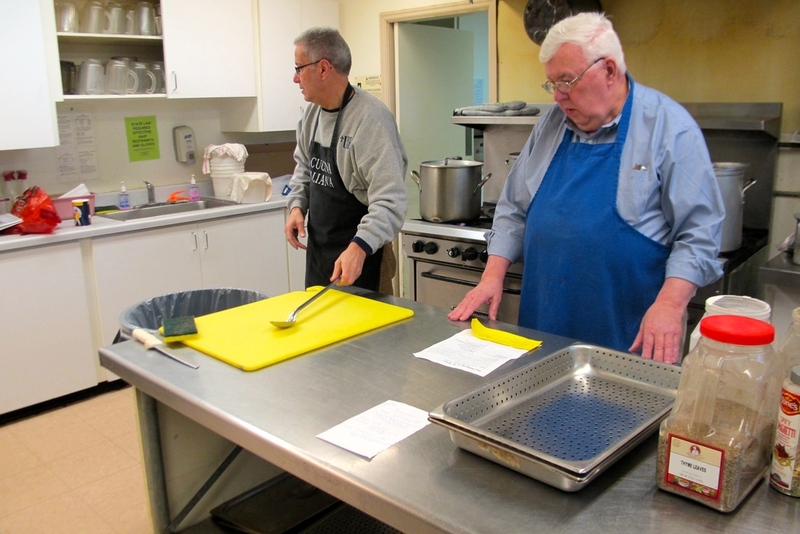 Hot, homemade meals are served to all who come at no cost to the recipient. Breakfast is served Monday through Friday mornings at our downtown site, St. James’ Episcopal Church, 833 W. Wisconsin Avenue. The majority of breakfast guests are adult males; 60-70% homeless. Legal, medical and mental health services are provided on site. Dinner is served Monday and Wednesday late afternoon at our south side location, Christian Faith Fellowship Church East, 724 S. Layton Blvd. Dinner guests come from the surrounding neighborhood; diverse in age and ethnic background. Saturday lunch is served at the above two sites and at Our Next Generation Neighborhood Center (ONGNC) , 35th & Lisbon. Guests at ONGNC are primarily African American with 20-30% children. Lunch is also provide on the 4th Saturday of the month at Mt. Carmel Lutheran church, 82nd & Center. The Shelter Meal Program provided three meals every day to residents of three shelters managed by Community Advocates: Women’s Refuge homeless and domestic violence shelters and Autumn West, housing for adult mentally ill. Community Advocates funded the program and the Gathering provided the staffing, food and delivery of services. This tutoring/mentoring program at 35th & Lisbon – one of our Saturday Lunch sites – serves a light meal four afternoons each week to program participants of middle school and high school age. The Gathering provides the underlying support for these meals. On Saturday, March 30, 468 Gathering guests were served a special Easter Meal at our three Saturday lunch sites. After hours of preparing ham with pineapple, sweet potatoes, yams, assorted dessert trays and green bean casseroles, the cooks, coordinators and volunteers at the Gathering’s three Saturday meal sites were ready to do what they do best: feed the Gathering’s community! The volunteer cooks arrived around seven in the morning to start preparing the food. There were three cook teams, one at each site. A couple of the teams had Gathering veterans who had been volunteering for decades but there were also some relatively new cooks. After the cooks prepared the food and had it all waiting to go in the warmers/ovens, the volunteer coordinators sprung into action. Coordinators make sure things are running smoothly and that all volunteers from the serving group have a role during the meal. One such coordinator is Ellie Moseley. Ellie has been coordinating with the Gathering for over fifteen years along with her husband, Harry. Ellie and Harry got involved when they moved to Milwaukee. They used to volunteer at a soup kitchen in Indianapolis and they wanted to find another opportunity to do similar work. Ellie explained that one of her favorite parts of the Gathering is getting to interact with the guests. “Everyone is so nice. There is one woman who comes regularly and wraps her arms around me and gives me a big hug.” Together, guests and volunteers can create an encouraging sense of community at the Gathering. Serving group volunteers begin showing up around 9:45, “suit up” with gloves, aprons, hats/hair nets, and set about wrapping silverware, pouring drinks, buttering bread, making salad, preparing dessert trays, and setting places for the guests. 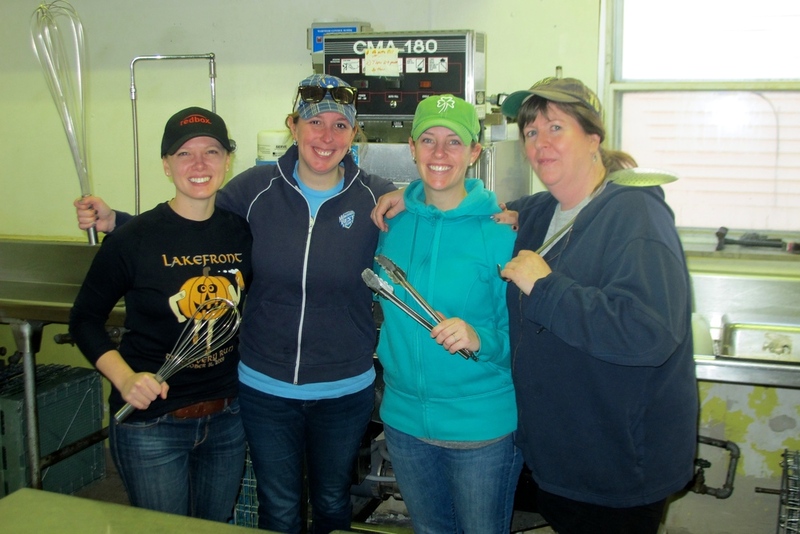 Thanks to Greater Spring Hill, St. Boniface and St. Paul’s Lutheran Church in Grafton, the Gathering’s Easter meals ran smoothly with the help of 45 total volunteers! After all the preparation the meal was served from 11:30 to 12:30. The Gathering was able to serve 468 guests, 46 of whom were children. Included in the Easter meal were treat bags donated by the different volunteer groups. Beautiful Easter treat bags, thanks St. Boniface!